To Drill or not to Drill, is that a question? In the maritime world nothing makes a mariner roll their eyes longer and stronger than having the Master or Mate announce, “We are having safety drills this afternoon!” Sleep loss, interference with you daily routine, checking off a box, paper work and having to discuss “in detail” yet again, how a fire can start in the galley area just makes a mariner want to walk the plank and go ashore for good. Or should they? Walking back through the front door to your loved ones means a mariner needs to have a safe productive voyage carrying out the mission of the company. Your responsibility means being able to respond to the inevitable that can happen aboard a vessel. In my 30 plus years as a mariner I have been aboard vessels which have experienced fires from engine base explosions, electrical circuit fires, and spontaneous combustion fires. Groundings, collisions with floating containers at sea, broken tow wires are just some of the problems mariners will face in their careers. The questions is, how do we save the vessel, our shipmates and enable us to walk back through the front door of our home at the end of our rotation at sea? Participating in the age old practice of safety drills, now a regulatory requirement of national and international maritime law is one answer to the above questions. Attitude, proficiency, and consistency play a key role in shipboard drills that resolve the crews ability to deal with emergencies aboard a vessel. Having read many NTSB accident investigation reports, personal accounts from fellow mariners of successful emergency outcomes and my own shipboard experiences confirms the need for regular ongoing safety drills by a vessel’s crew. These practices lead to crew confidence in their own abilities, muscle memory on equipment use in times of emotional stress, confidence in fellow crew members to carry out their duties, and reduces the “flight” reaction of the human response of “flight or fight”. Designing, practicing and engaging in shipboard drills is paramount on today’s towing vessels. Vessels with unique emergency problems beyond the standard Fire, Man Overboard and Abandon Ship drills. MARINE SAFETY SERVICES (MSS) has a combined 90 years of mariner experiences to assist your towing vessel crews to gain the knowledge, understanding and instruction aboard the specific towing vessels they serve aboard. Don’t let your company be another headline or USCG accident statistic, let MSS perform a risk assessment, design and train your tug crews to meet regulatory requirements, but MOST importantly bring them through the front door of their homes at the end of the voyage while also having a safe productive profitable voyage for your company. Drills should be common practice aboard your vessel with crews looking forward to participating both physically and with verbal input, thus building confidence, and producing a “fight” response to any given situation. Contact MSS today about a safety drill training program for your vessel’s crew. Many times in my consulting business I need to know what the “Gross Tonnage” of a particular vessel is. This will be the driving force of MANY regulations and how they affect a mariner’s licensing progression as well as the myriad of regulations that may affect the vessel’s operation and regulatory process. Many mariners and vessel operators are still unsure of what “tonnage” is and how it is determined. Often the answer I receive is “my boat weighs 40,000 lbs”. They may be confusing this with “displacement” which is a measurement of how much water a vessel displaces, based on the volume of water being pushed aside by the submerged portion of the hull. This has absolutely nothing to do with gross tonnage. There are two measurement systems used to determine a value for gross tonnage of a particular vessel. There is the “Regulatory” tonnage system, which is our U.S. Domestic tonnage measurement system. The initials for this are “GRT”, which is found on a vessel’s certificate of documentation (COD), a certificate of inspection (COI), or in some cases a “tonnage certificate”. Under the Regulatory System there are various formulas that allow spaces to be deducted. GRT is an INTERNAL VOLUME measurement of your vessel based on the dimensions of your vessel, such as Length, Breadth, and “depth” (not draft). The Coast Guard will accept formal admeasurement calculations from classification societies, such as ABS and once it’s officially documented with a GRT, that IS the tonnage that will be used for regulatory purposes. The second measurement system is called the “Convention” tonnage system. This is based off of the International Convention of Tonnage Measurement of Ships, 1969. Yes, that’s correct, 1969! This system uses the same basic principle of measurement of the internal volume (carrying capacity) of a vessel, but is much less forgiving with respect to “exempted” spaces and formulas that allow this. The initials for this system are “GT” and you may also see this tonnage listed on a vessels COD or COI if it is measured under this system. In some cases a vessel may be measured under BOTH systems. This system is required for vessels built after a certain date and for those that are international trade. The STCW code uses the Convention tonnage system as it’s basis for the convention’s rules and regulations pertaining to the certification of mariners. Within the code, the United States was able to have the International Maritime Organization (IMO) place “equivalencies” within the scheme for two of our U.S. tonnage endorsements. These are 200 GRT and 1600 GRT. Under this equivalency clause, 200 GRT is equal to 500 GT and 1600 GRT is equal to 3000 GT. This also applies to vessel’s measured under our GRT (Regulatory) system and when STCW applies. For example, a commercial vessel that is over 200 GRT, sailing beyond the Boundary Line (46 CFR Part 7), which is considered “seagoing”, the STCW code applies to that vessel and the mariners employed on board. This is because the vessel falls under the category of vessels of 500 GT or more, under the STCW code. This can be very confusing on both a licensing and vessel operational scheme. Please contact us today if you have any questions! much as what regulatory changes apply to them. Therein lies much of the confusion. 2. The Third Party Option. These two options have very significant and separate processes associated with them. electronic record that captures items noted in 46 CFR 140.915.
option that the owner must have a robust TSMS in place and in operation across the fleet. For more questions please contact us today! 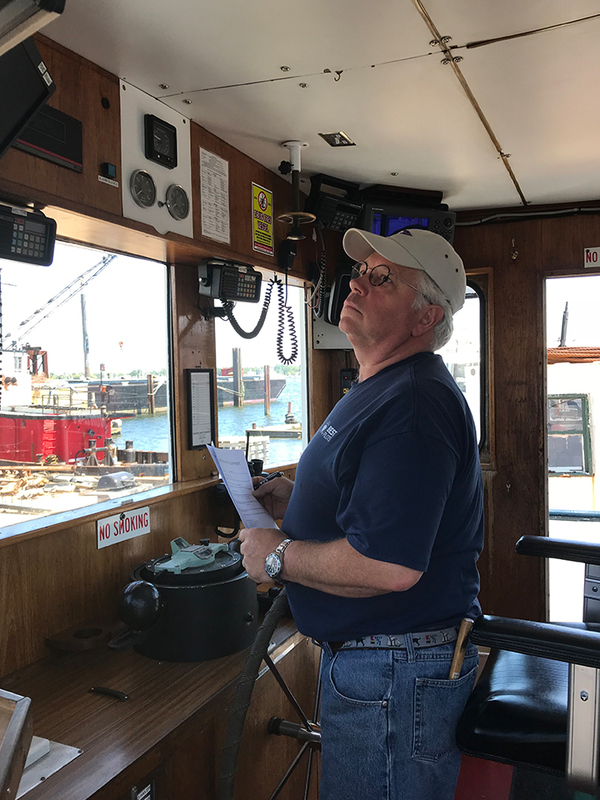 At Maritime TOAR Assessments, we understand how important obtaining a towing endorsement is for Mariners looking to advance into wheelhouse positions. Since 2009, we have assisted Mariners in their completion of USCG Towing Officer Assessment Records (TOAR). The simulator training facility at Northeast Maritime Institute in Fairhaven, Massachusetts provides training and assessment scenarios to Mariners for Inland, Near Coastal/Ocean and Western Rivers endorsements. Our simulator, the Class A full bridge tug simulator with 270 degree field of view, uses the most current navigational equipment, providing quality and realistic visualization. It also has multiple configurations for ASD, Western River towboats with flanking rudders, and conventional twin screw tugs with real HW controls. The tug’s towing winch and necessary components are realistically comparable to actual tug operational systems, which enables the mariner to be assessed in all maneuvering tasks including berthing, anchoring, MOB (man overboard) drills, and streaming tow on tugs. 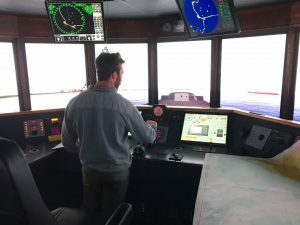 In today’s industry, the benefits of bridge simulators bear a great deal of resemblance to flight simulators when comparing methodologies of assessing and training potential tug boat operators. 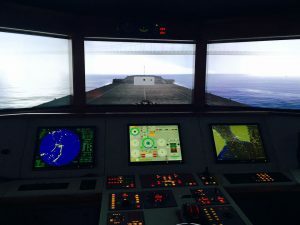 When real time operations cannot be engaged because it is not assessable, dangerous or unacceptable while the vessel is on charter, the bridge simulator allows the Mariner to be trained and assessed in performing controlled tasks in various environmental conditions, like restricted visibility—all without risking the safety of the crew, public or equipment. From vessel familiarization, rules of the road, maneuvering, and standard operations, our program offers advantages and opportunities to improve operator performance in realistic conditions that they will encounter in their future tug boat operating career. Maritime TOAR Assessments program is customized to incorporate all required USCG assessments. Our simulator training is optimized to achieve the best results through our training management system. In one centralized system, it reliably monitors the performance of potential officers of towing endorsements and designated examiners’ data grades to ensure regulatory compliance. After undergoing the realistic situations within the simulator and being safely trained or assessed on how to approach them by our licensed designated examiners, newly endorsed mariners can feel confident that they’ve been assessed and have received ample training to sufficiently build on their advancement in the towing industry. If you’re ready to take the next step in your career, obtain your TOAR from Maritime TOAR Assessments.